CLEO is proud to be a part of your community. We take pride in our commitment to not only inform home and business owners, but also educate our children of the community early and promote a healthy and efficient lifestyle. We provide participating schools with events, contests, and fundraisers to help promote energy-efficiency and raise money for schools in appreciation for their participation and interest in our programs. 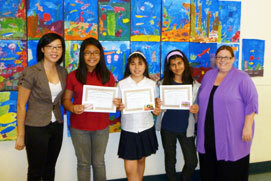 The CLEO Green School Program partners with schools, teachers, parents, and students to create a green energy ethics. The program hosts Energy Artist Contests, Energy Fundraisers for schools and Home Energy Efficiency surveys transforming energy knowledge to real energy savings. Learn more about the CLEO School Program! Call toll-free 1.888.898.6788 or complete the form below.